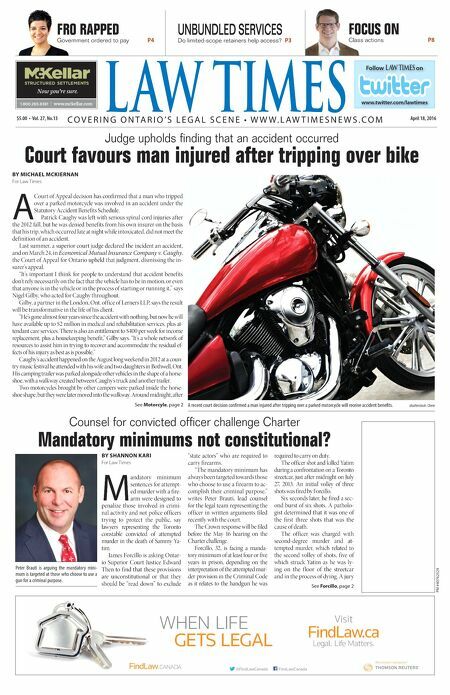 Judge upholds finding that an accident occurred Court favours man injured after tripping over bike BY MICHAEL MCKIERNAN For Law Times A Court of Appeal decision has confirmed that a man who tripped over a parked motorcycle was involved in an accident under the Statutory Accident Benefits Schedule. Patrick Caughy was left with serious spinal cord injuries after the 2012 fall, but he was denied benefits from his own insurer on the basis that his trip, which occurred late at night while intoxicated, did not meet the definition of an accident. Last summer, a superior court judge declared the incident an accident, and on March 24, in Economical Mutual Insurance Company v. Caughy, the Court of Appeal for Ontario upheld that judgment, dismissing the in- surer's appeal. "It's important I think for people to understand that accident benefits don't rely necessarily on the fact that the vehicle has to be in motion, or even that anyone is in the vehicle or in the process of starting or running it," says Nigel Gilby, who acted for Caughy throughout. Gilby, a partner in the London, Ont. office of Lerners LLP, says the result will be transformative in the life of his client. "He's gone almost four years since the accident with nothing, but now he will have available up to $2 million in medical and rehabilitation services, plus at- tendant care services. There is also an entitlement to $400 per week for income replacement, plus a housekeeping benefit," Gilby says. "It's a whole network of resources to assist him in trying to recover and accommodate the residual ef- fects of his injury as best as is possible." Caughy's accident happened on the August long weekend in 2012 at a coun- try music festival he attended with his wife and two daughters in Bothwell, Ont. His camping trailer was parked alongside other vehicles in the shape of a horse- shoe, with a walkway created between Caughy's truck and another trailer. Two motorcycles brought by other campers were parked inside the horse- shoe shape, but they were later moved into the walkway. Around midnight, after Counsel for convicted officer challenge Charter Mandatory minimums not constitutional? BY SHANNON KARI For Law Times M andatory minimum sentences for attempt- ed murder with a fire- arm were designed to penalize those involved in crimi- nal activity and not police officers trying to protect the public, say lawyers representing the Toronto constable convicted of attempted murder in the death of Sammy Ya- tim. James Forcillo is asking Ontar- io Superior Court Justice Edward Then to find that these provisions are unconstitutional or that they should be "read down" to exclude "state actors" who are required to carry firearms. "The mandatory minimum has always been targeted towards those who choose to use a firearm to ac- complish their criminal purpose," writes Peter Brauti, lead counsel for the legal team representing the officer in written arguments filed recently with the court. The Crown response will be filed before the May 16 hearing on the Charter challenge. Forcillo, 32, is facing a manda- tory minimum of at least four or five years in prison, depending on the interpretation of the attempted mur- der provision in the Criminal Code as it relates to the handgun he was required to carry on duty. The officer shot and killed Yatim during a confrontation on a Toronto streetcar, just after midnight on July 27, 2013. An initial volley of three shots was fired by Forcillo. Six seconds later, he fired a sec- ond burst of six shots. A patholo- gist determined that it was one of the first three shots that was the cause of death. The officer was charged with second-degree murder and at- tempted murder, which related to the second volley of shots, five of which struck Yatim as he was ly- ing on the f loor of the streetcar and in the process of dying. A jury FRO RAPPED Government ordered to pay P4 UNBUNDLED SERVICES Do limited-scope retainers help access? P3 FOCUS ON Class actions P8 See Forcillo, page 2 See Motorcyle, page 2 PM #40762529 $5.00 • Vol. 27, No.13 April 18, 2016 L AW TIMES & $#&!&jmmm$cYa[bbWh$Yec ntitled-4 1 12-03-20 10:44 AM C O V E R I N G O N T A R I O ' S L E G A L S C E N E • W W W . L A W T I M E S N E W S . C O M A recent court decision confirmed a man injured after tripping over a parked motorcycle will receive accident benefits. shutterstock: Chere Follow LAW TIMES on www.twitter.com/lawtimes WHEN LIFE GETS LEGAL FindLaw.ca Legal. Life Matters. Visit @FindLawCanada FindLawCanada Findlaw_LT_Apr11_16.indd 1 2016-04-06 3:20 PM Peter Brauti is arguing the mandatory mini- mum is targeted at those who choose to use a gun for a criminal purpose.